When I arrived in Shanghai last year the first thing I noticed was a huge Ferris wheel somewhere in PuDong. It was higher than some surrounding skyscrapers! The next thing were the confusing motorways as my driver took me from one end of Shanghai to the other. It took us two hours to reach my accommodation. Shanghai, although huge, is not too confusing once you get used to it. However, my first day running errands there was not the easiest thing I’ve ever done! Luckily I met a Chinese guy who helped me find my way to where I had to be. After that I understood the city’s structure and it was a piece of cake (but never left the house without a map, just in case). The city has so much to offer that it’s difficult to grasp it in the short time I spent there, especially since I was working and not on holiday! 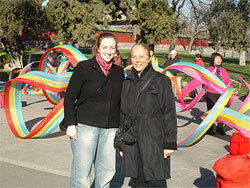 China is a country which has always fascinated me and the thought of visiting was truly a life long dream. My trip to Shanghai and Beijing was absolutely amazing. I loved the combination of ancient history and ultra-modern technology and architecture. I can honestly say that the reality of life in China far surpassed my expectations. Travelling as a complete beginner in Chinese I was slightly concerned about what to expect when I arrived in China, but there was no need to worry! I was met at the airport by the school’s transfer driver Mr Wu who took me directly to my accommodation and after a long flight it was well worth booking this service. The other night I was sitting at home, wondering what to watch on TV. To my surprise, instead of news, the opening ceremonies of the Special Summer Olympics for 2007 was on. Shanghai was hosting this event. The whole event lasted 3 hours and was an incredible show of music, dance, entertainers and of course the athletes who were here to participate…7,000 of them! What a spectacular event it was. Every country was represented, and they all proudly walked into the stadium as they called their country, walking behind their flag that was being carried just in front of each group. The athletes all dressed in their uniforms, some matching the colors of their countries’ flag, while others were wearing more ethnical clothes. I was so impressed at the organization and the amount of work that went into the opening night ceremonies. Many volunteers worked at the event to help make it happen and keep the cost down. A Night Out in….. Shanghai! 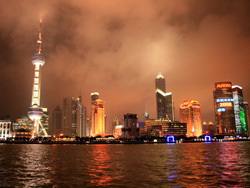 Shanghai’s night life is simply fantastic! You’ll find nightclubs, bars and KTV-bars everywhere you go in the city. The first thing that strikes you when you are out and about at night is the prices of the drinks. If you go to a club or bar in Shanghai, you pay around 50 RMB for a beer (approximately 5 euros), which is not bad at all! Karaoke is huge in Asia, so don’t forget to try it whilst you’re in Shanghai! There are lots of karoke bars (KTV bars) in Shanghai. One night I decided, together with some of the other students from the Chinese school in Shanghai, to go to a KTV bar in Xu Jia Hui, a modern area in the Xu Hui district. This is a huge district with a lot of stores and shopping malls. Ever been to Shanghai….? YOU SHOULD! It is a great and modern city and there are a lot of things to do. 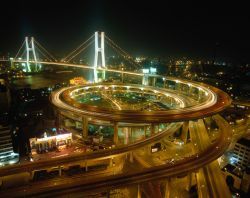 From shopping, nice bars/restaurants and a great nightlife, to sightseeing and museums, Shanghai has got it all! 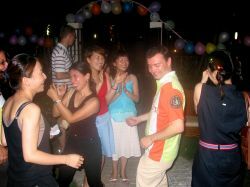 My name is Daniel and I took a language course in Shanghai last summer. I loved the city. When you are a student in a big and strange city, you want to explore everything…so that is what I did!